The Waffen-SS divisions from this and the previous page were Germany’s most effective troops of WW2. 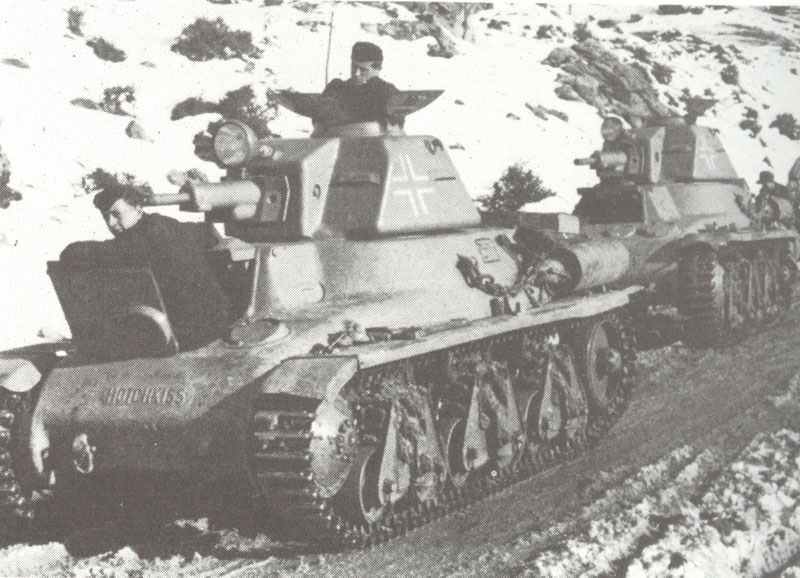 Captured French Hotchkiss H-35 tanks on operations against Yugoslav partisans with 7 SS division Prinz Eugen, 1944. March 1942 (operational October 1942). Surrendered to Yugoslav Partisans at Cilli, Slovenia. 2 mountain infantry regiments, also cavalry and light armoured elements. Armoured support units with captured French, Italian and Russian tanks. 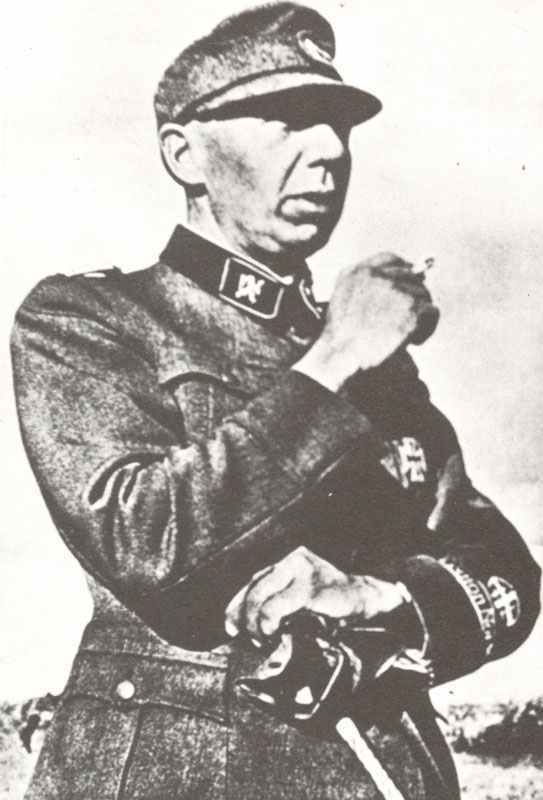 Raised from ethnic Germans living in the Balkans, officers mainly Austrians and Rumanians. Used entirely against partisans and civilians, bad record atrocities. 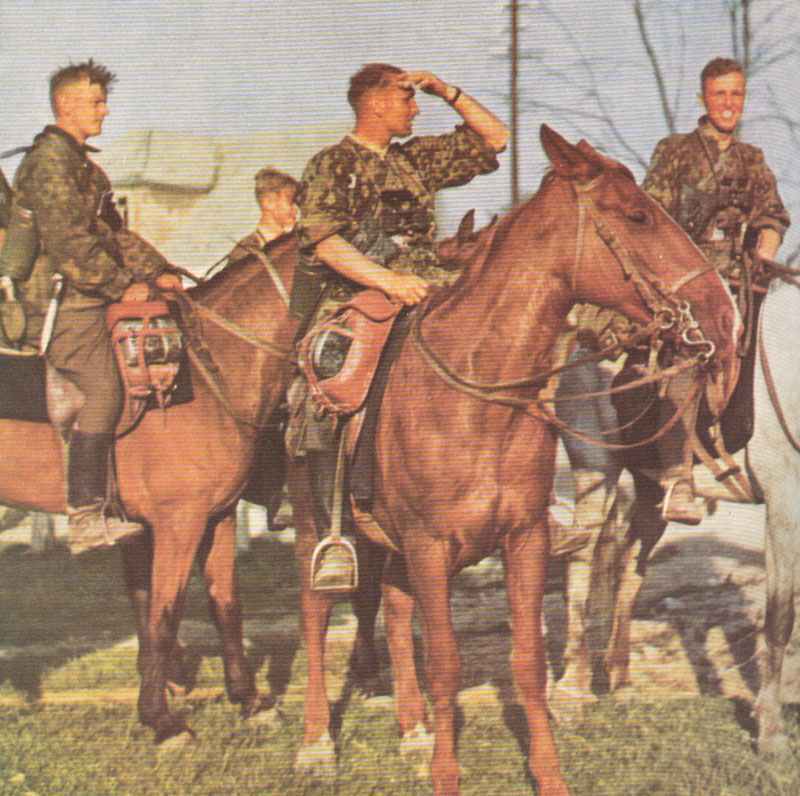 Troopers of 8 SS Cavalry division. As division from June 1942. Annihilated in fall of Budapest, February 1945. Operated partly on anti-partisan duties, partly front-line combat. 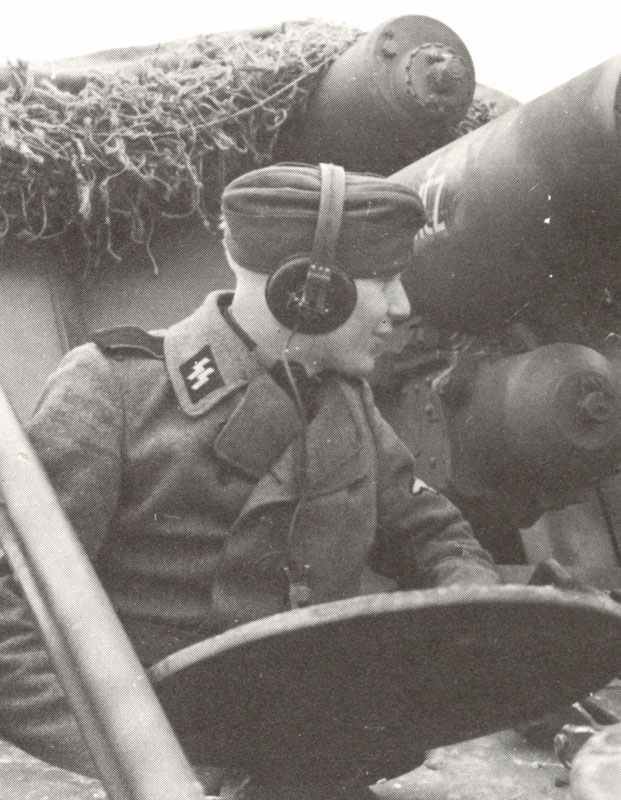 Crewman of Hummel SP artillery of 9 SS division Hohenstaufen. March 1943 (operational December 1943). Surrendered to US at Steyr (Austria), 5 May 1945. 2 motorized infantry regiments (each with 3 battalions). 1 Panzer battalion, since June 1944 additional Panzer V Panther battalion. Hummel SP artillery guns (12 or more). Total: 105 tanks until June 1944, later 154. Rested near Arnheim when Allied parachute assault took place. January 1943 (operational March 1944). Most members surrendered to US in Czechoslovakia, May 1945. 1 Panzer battalion, since June 1944 additional Panzer V Panther battalion. Total: 93 tanks until June 1944, later 142. Raised from 18-year-old German conscripts, worked up in France during 1943. May 1943 (operational September 1943). Fought to annihilation at battle for Berlin, 1945. 3 (1 Danish, 2 Norwegians) , later 2 motorized infantry regiments (each with 3 battalions). 4 Panzer companies (Panzer IV, Panzer V Panther, Tiger tanks ), 3 assault gun companies (StuG IV). Total strength 1943 : 11,400 men. Incorporating various foreign volunteer units (Danish, Norwegians, Swedish, Finns, Swiss, Dutch) and ethnic Germans, mainly from Hungary and Rumania. 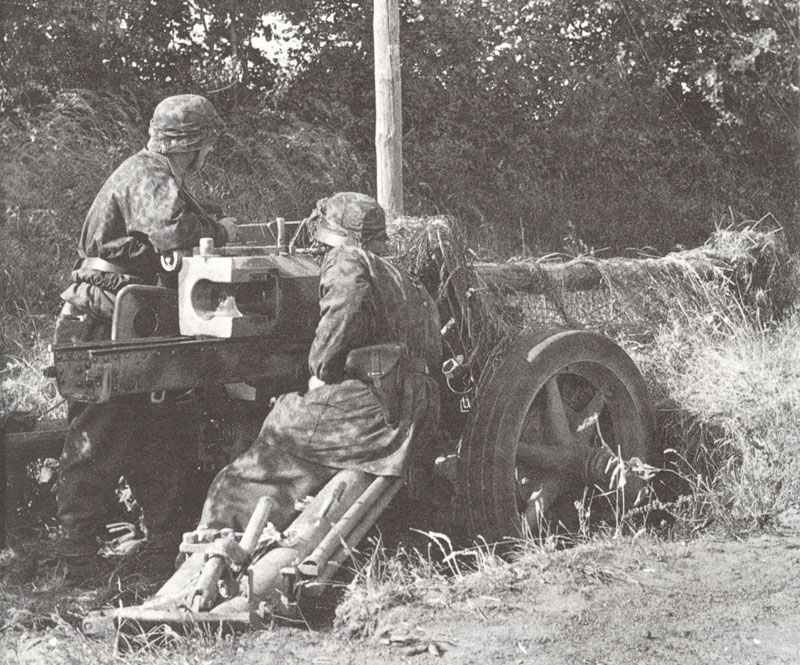 7.5cm AT gun of 12 SS ‘Hitlerjugend’ in Normandy. July 1943 (operational June 1944). Surrendered to US near Enns, Austria (only 455 survivors). 4 Panzer companies with Panzer IV, 4 companies with Panzer V Panther, 18 self-propelled artillery guns Hummel. Personnel largely fanatical 17-year-old Hitler Youth boys, cadre from LAH. Lost over 60% in just first four weeks in Normandy.